There are a whole range of dog allergy symptoms, and some of them might be surprising or unexpected. With canine allergies, you're most likely not going to see the same type of symptoms as you would see in human family members with the same problem. Dogs generally don't sneeze and cough (although that can happen), instead the symptoms are usually seen as skin irritations or inflammation. 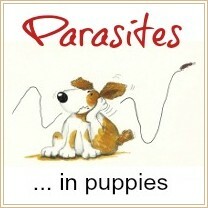 This usually makes your pet itchy and uncomfortable.... sometimes to the point of being absolutely miserable! Lots of things can cause allergies, from parasites such as fleas or mosquitoes, to dog food ingredients or even seasonal triggers such as pollen or mold... and more. Some breeds are more prone to allergies than others, and older dogs are at a greater risk of developing allergy symptoms than younger puppies. Allergic reactions to canine vaccines can happen to puppies and dogs of any age, but tends to be more common in young puppies. Face rubbing or repeatedly rubbing his head against the carpet/floor. Shaking his head repeatedly, pawing at his ears, or rubbing them against the carpet/floor. 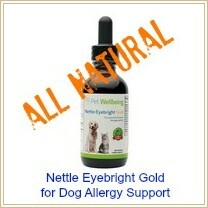 *The last 3 symptoms are more often seen in a dog who is sensitive to, rather than truly allergic to, food ingredients. 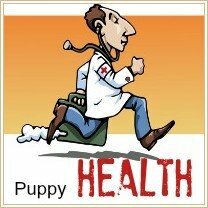 They're also by far the most frequent sign of a variety of dog illnesses/diseases. What Can Trigger Dog Allergy Symptoms? Regardless of what is triggering your pup's allergy, the symptoms will usually show up as skin problems, but of course not ALL dog skin conditions are caused by allergies. Topical allergens including shampoos/conditioners, topical medications, cleaning products, fabrics.... even grass! Although most dog allergy symptoms show up as some type of skin irritation and itching, there can be subtle differences in the way dogs react to various allergens. 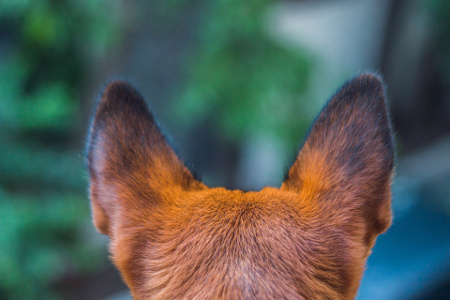 If you pay close attention to precisely which symptoms you're seeing in your puppy or dog, it can help point you in the right direction in terms of finding the exact 'trigger' or allergen which is causing the problem. Many dogs suffer from flea allergies (aka flea allergy dermatitis), but it's not the actual flea that they're allergic to, it's the flea's saliva. 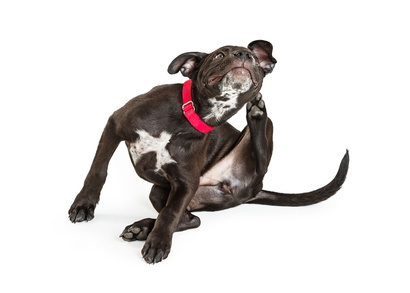 The enzymes in flea saliva can cause intense irritation when it comes in contact with your dog's skin... and sometimes it only takes one flea bite to set up quite a lot of itching and discomfort. Canine flea allergies usually cause your dog to indulge in a lot (and I mean a LOT) of licking and biting at himself. Particularly at his feet, legs, belly and tail area. You may also start to see 'hot spots' - these are areas of skin which become red, irritated and inflamed. There might also be patchy hair loss, in the same areas as the hot spots, or located on different parts of his body. 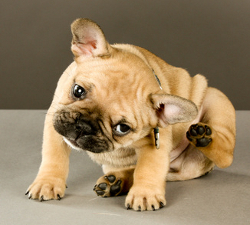 If your puppy or dog has a lot of fleas you'll probably be able to see them (especially if you look in the fur around his neck, ears, groin or tail area). If there are just one or two you may only notice the little black specks of flea dirt that they leave behind in a dog's fur. Again, the most noticeable sign that your pup may be experiencing dog food allergies is intense licking, biting, chewing and scratching at his body. Recurring ear infections or constant head shaking, ear rubbing etc. 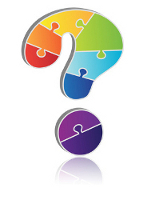 are also most often seen when food ingredients are the allergy trigger. Some dogs aren't necessarily allergic to ingredients in their food, but are sensitive to them instead. In these cases you may find that your dog simply has an 'upset tummy' that just won't clear up until their diet is changed. Mild, and recurring, cases of diarrhea or vomiting are common in this situation and bear in mind that it's not only ingredients that are in regular dog or puppy food that can be the problem. 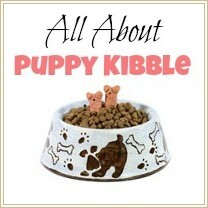 Take a closer look at the dog treats and anything else your pup eats too. Low grade, cheap or generic foods are more likely to cause sensitivities/allergies because of the quality of the ingredients as well as the number of additives, chemicals, fillers and 'junk' they contain. 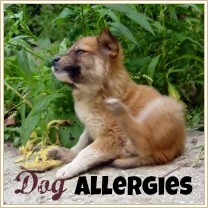 You'll also find a wealth of information on recognizing and treating canine food allergies on my Dog Food Allergies page. Just like people, dogs can have an allergic reaction to many airborne substances, like pollen or mold, and to things such as dustmites or dander (dead skin cells). The symptoms this type of allergy (aka Atopy) are very similar to those seen in dog allergies caused by fleas. Intense licking, chewing and scratching at certain areas of the body including tail area, legs and feet and belly. This can lead to hot spots and patchy hair loss. The type of skin irritation caused by topical allergies (basically direct skin contact with the allergen) might be more localized than you might see in response to an airborne allergy or food allergy. Intense itching, often accompanied by redness and maybe swelling of the skin is common. 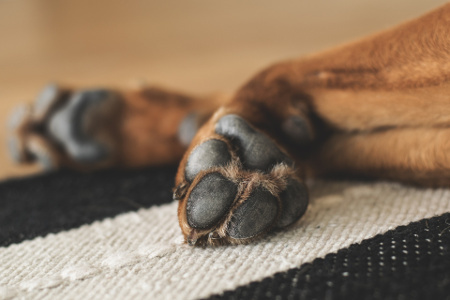 If your dog's feet are 'hot', itchy and red, but the rest of his body seems fine, then it's very possible he's allergic to something that his feet are coming in contact with on a regular basis.... carpets (especially those that have been shampooed recently, or treated with a deodorizer), and even grass are common culprits. If the main area of itching seems to be around his neck, then it could be something in his collar that he's reacting to. Many puppies have some sort of mild reaction to their vaccinations, but these are a vital part of responsible and effective puppy health care and the risks associated with NOT being vaccinated are much, much higher! Minor symptoms can include loss of appetite, lethargy and possibly some localized soreness or swelling at the site of the injection. More severe reactions may include hives or generalized swelling, difficulty breathing, even seizures. Some breeds of dog are more inclined than others to suffer from an allergic reaction to their vaccinations, and some particular vaccines are more likely to cause problems than others. To learn more about all of this, check out my Puppy Shots page. No matter what's causing your pet's allergies, you can figure out how to help him feel better by visiting my Dog Allergy Treatment page. It has everything you need to get rid of the 'itchies' and even eliminate the problem for good!